Few things say “welcome summer” like the sunflower. Its bright petals and huge “face” are easily recognizable. I love everything about sunflowers from admiring their beauty to chomping on their seeds. It seems that every part of this magnificent plant is usable. Even the stalk can be dried and used for kindling during the winter months. While Kansas is “The Sunflower State,” here in Bayou Country, we have an impressive trail of sunflowers. 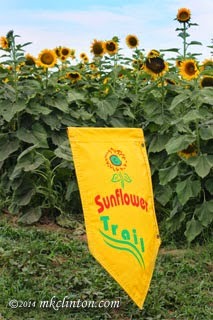 The North Caddo Sunflower Trail is located in and around the small town of Dixie, Louisiana. It began back in 1996 when John Sloan and a friend decided to plant sunflowers for their fall hunting expeditions. Mr. Sloan said that one day it was just the quiet of his fields and the next day he saw painters, photographers, and sightseers stopping to admire his field of happy flowers. 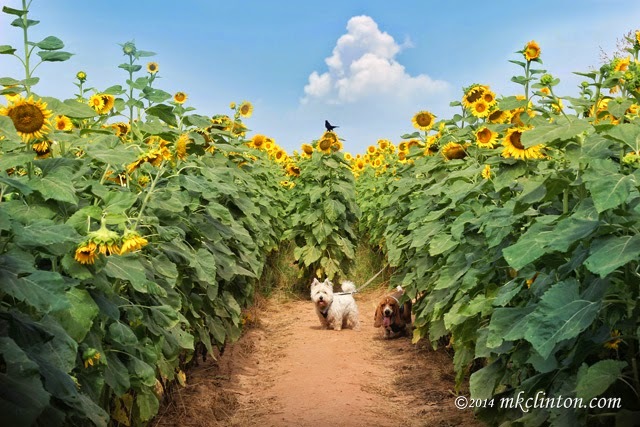 Neil Johnson captured the magic of this field in his book, “A Field of Sunflowers.” The massive twenty-acre field is located on the Cairo Plantation, although there are rows of sunflowers along a thirty-mile stretch leading to Gilliam, Louisiana. The friendly people of Gilliam hold a one-day Sunflower Festival to honor this brilliant bloom. This was the festival’s fourteenth year and it is gaining in popularity drawing visitors from near and far. sandy soil, and are both heat and drought resistant. 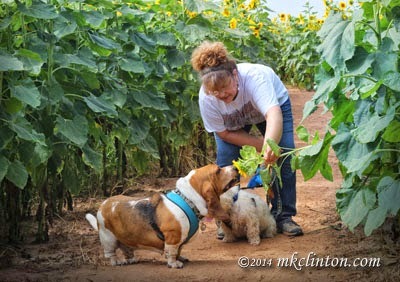 The trail follows along the Red River and the river soil is excellent for growing not only sunflowers, but also cotton, corn, soybeans, and sweet potatoes. Sunflowers are annuals and planted after the danger of a spring frost has past when the soil temperature is around 55 to 60 degrees. The large seeds are planted no more than 1” deep and 4” to 6” apart in well-dug, loose soil. Planting the seeds over a 5 to 6 week period will enable you to enjoy continuous blooms throughout the summer. We loaded up the boys and drove the short trip to Cairo Plantation this past weekend. It is our first time to see the trail firsthand. I was absolutely blown away by the beauty, brilliant colors, and enormity of the sunflowers. We saw quite a few birds enjoying them, but luckily, no deer or other wild animals that love to munch on the flowers. The boys had a sniff fest as they kicked up the river dirt while we walked along the trail cut through the field. We didn’t attend the festival due to the extreme heat of the first weekend of summer. You’ll notice both of the boys’ tongues are hanging out of their mouths. When we reached the car, I used my Kurgo Zippy Bowl and filled it once for each of them. They both emptied the bowl when it was their turn. I sit in the backseat with them, because road trips are still new to them. Bentley stuck his head between the front seats and hogged the air conditioning. We did make a couple of more stops for really cool photo shoots and I’ll be sharing those with you in the coming days. Here are some Fun Facts about the Sunflower! 1. The sunflower is actually made of many tiny flowers called florets. The center florets look like a normal flower and the outer florets look like yellow petals. Together they make up a “false flower” and help insects and birds see the sunflower. After pollination, every little floret produces a seed. 2. A sunflower can grow up to 10 ft. tall and the flower head can be an astonishing 11.8 inches wide. 3. In 2012, a sunflower in Germany grew to a height of 27 ft. and made the Guinness Book of World Records. 5. There are two kinds of sunflower seeds. Sunflower oil used in cooking, margarines are made from black seeds, and the yummy snack food is made from the striped seeds. The seeds are popular in birdseed mixtures. 6. The sunflower is native to the America's and used extensively by Native American Indians for food, as oil, in bread, medical ointments, dyes and body paints. 7. It is a common misconception that sunflowers track the sun across the sky during the day. While the young flowers do show this movement, a mature flower usually points in a fixed eastern direction. *Please, vote for Bentley again today on Love is being owned by a Husky’s K9 Kelp photo contest. We are currently in the lead, but need your vote to stay there. Thank you so much! Click here. **Bentley’s Bargains additional 15% off secret code expires June 30th. Just enter MAYFLOWER-15 when you place your order. 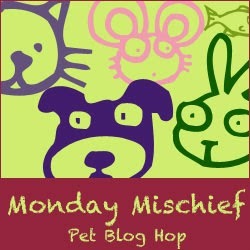 We are joining the fun Mischief Monday’s blog hop hosted by My Brown Newfies, Alfie’s Blog, and Snoopy’s Dog Blog. Have fun laughing along with these other mischievous blogs! We had fun despite the sweltering heat. 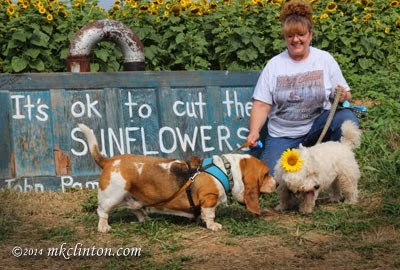 I love the pic of Pierre with the sunflower on his head! it is one of our best memories of living in Italy - driving through Tuscany and seeing field after field of sunflowers. Beautiful spot. We've grown sunflowers a few times and they are so beautiful. The birds love them when they are finished blooming. We cut a bouquet of them. I'd love to grow some in our backyard next year. Oh wow!!! That place looks SO beautiful!!!! I love your photos! And I would LOVE to go to a spot like this!! They are amazing flowers. My grandson brought one home from kindergarten and five years later we still had them coming up from the original plant. That is so cool! I wonder if I could grow some from the ones we cut. I'll definitely have to give it a try! Wow - great shots - that place looks awesome! What beeeeautiful pictures! We love sunflowers, the P.A. would love to go there! Voted fur Bentley too, good luck! Wow, Bentley! I don't think I've ever seen so many sunflowers in one spot! We were very impressed too. They were enormous compared to Bentley & Pierre. Heck, they were even huge compared to us! We have lotsa sunflowers here in Texas, too... years ago Momma threw some sunflower seeds in a bed and they still come back! I am going to try to get some of the ones that we cut to grow next year. I'd love to have some of my own. What great photos and a fun outing. Those sunflowers and that field...wow. It was incredible. There is a cornfield maze close to this sunflower field that we want to venture into this fall. Nice! When Mom lived in southern Germany, there were pick your own flower fields all over the place and she has told me she would pick lots of sunflowers. That was all before our time, she had Trine with her back then. Good to see you like sniffin' the flowers, Mr. Bentley. I've never seen so many sunflowers at once. They're such a cheerful flower. We haven't either! It seemed to have a happy effect on everyone that was wandering through the field, even in the ridiculous heat. Luv y'all in da sunflowers! Thanks Whitley! We have a grand adventure sniffing and kicking up dust! sunflowers have to be the HAPPIEST looking flowers ever, love them! Thanks for the background about them too! They really are enough to make even the grumpiest of people smile. We heard so many oohhs & aahhs while we wandered around the trail. I'll have more colorful shots on Wordless Wednesday! That is soooo cool! We are so used to them here (yep, in Kansas) that we didn't know they were so prolific in LA! We have some land that we rent out to farmers and they rotate what the call "beans" (soybeans) with corn, winter wheat and "flowers" (took us a while to figure out they meant SUNflowers- ha!). I vaguely remember seeing tons of sunflowers when I was young. I spent the summer with my uncle at Fort Leavenworth, Kansas. (He was in the military, not prison!) hahaha! That looks incredible! I wish we lived close enough to visit. You must have had a great time! Gorgeous! What a fun and picturesque outing! We love to watch the Tour de France every summer and they always have one day where they ride past the sunflower fields. So pretty! Looks like a good time was had by all and you got some wonderful pictures. I cannot wait until Wednesday to see more of the beautiful sunflower fields. How very interesting! We like sunflowers too! Oh, those are BEAUTIFULS!!! And you guys look FABulous there in the sunflower field!!! Ma loves the sunflowers, and is kickin' herself for not planting any yet! What a great post and adventure. I love the last picture. Lots of fun info today! Thank you for sharing!! 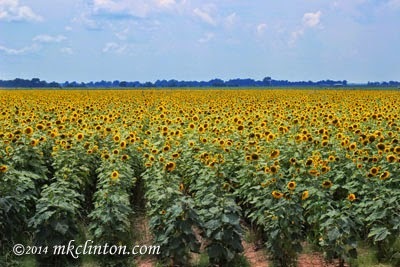 I LOVE sunflowers but have never seen fields and fields of them like that....gorgeous! I usually plant some seeds but am lucky if they end up blooming by late summer. I leave them out for the winter so the birds can eat the seeds though!